For three hours last night in Ozawa Hall, Nicholas McGegan led Philharmonia Baroque Orchestra and an amazing ensemble of singers in a stellar concert performance of Handel’s Teseo. A hybrid work first performed in 1713, the opera has a libretto by Nicola Haym adapted from Quinault’s for Lully’s 1675 Thésée. The story has one foot in antiquity and some episodes can be found in Plutarch’s Life of Theseus. After a short and disaster-laden initial run, including musical additions and possibly further stage entertainments, it lay fallow for two centuries. Revived in 1947, the work received its Boston première during the 1985 Boston Early Music Festival. Handel’s third opera after arriving in England, it combines French and Italian traditions and styles, wrapped in an extravagant package, with arias to showcase virtuosic performances (originally Nicolini in the title role). In five acts like French tragédies-lyriques, the plot includes two pairs of lovers: Arcane and Clizia are narrative doublets to Teseo and Agilea, albeit lower on the social scale. The music alternates arias and recitatives, although the latter are greatly reduced from the French model; this leaves some gaps in the plot (the original libretto included for the audience bracketed recitative text necessary for the plot but not set to music), and emphasizes the arias. Military exploits in the plot serve to rouse the blood of lovers as the exploits of a classical hero and those around him are scripted into more of a medieval romance. Despite the disjointed narrative (what opera is not, really? ), Handel is playing with musical and textual traditions and creates a delightful work. The music has “very few known self-borrowings” (as McGegan writes) and it and the plot seem to look back toward Purcell’s Dido and Aeneas when it expresses rage and invokes the chthonic spirits for vengeance. Hopefully Teseo will soon be as well-known and frequently performed as that tragic tale. This was a concert performance of Teseo with sartorial nods in the direction of a fully staged rendition, blocking and gestures reinforcing delivery of the music. It would be wonderful to see it staged. The ending requires a deus ex machina as Minerva’s priest protects the Athenians from the magic of Medea; that machine must do double duty as Medea rides away in a carriage drawn by dragons (as at the end of the Euripides play and famously depicted on a Lucanian krater now in the Cleveland Museum of Art). Instead, we saw singers traverse downstage and upstage while the musicians circled around the paired harpsichords at center stage. One romantic squabble saw a heroine get a rise out of the theorbo as David Tayler gamely played on. Props were minimal: sword, throne, scepter, cup. The plot is difficult to summarize succinctly. The curtain rises on a battle at Athens, in which Teseo acquits himself gloriously in his role as commanding general for the Athenians. He has led Agilea, Greek princess and ward of King Egeo, to sanctuary—as well as Clizia, Agilea’s confidante. Both women are in love with their hero and Clizia provokes jealousy in her lover, Arcane (advisor to King Egeo) as a result. Egeo, betrothed to Medea, announces his love for Agilea, who spurns it, and the throne that would await her, in favor of Teseo; meanwhile Egeo pawns Medea off on his son, Teseo, and both Egeo and Medea seem content with this turn of events. Ill-loved sorceress that she is, Medea learns of Teseo’s love for Agilea and plots her revenge on Cupid (as well as on Egeo, Teseo, Agilea, Athens, and anyone who would stand in her way) by playing up Egeo’s jealousy for his favored and esteemed general (whom the king does not recognize as his own son, Teseo, owing to a disguise as the boy looks to stand on his own merits and not the coattails, or throne, attendant upon his birth). Medea presents herself as abettor and patroness to Teseo when really she serves only her own ends. Then she calls forth the shades to torment Agilea into renouncing her love for Teseo; when Agilea relents in order to save Teseo’s life, Medea adds that Agilea must announce her infidelity to him herself. That goes horribly awry, as true love cannot be gainsaid. Feigning acceptance, Medea delivers to Egeo a poisoned cup for his too-favored general, lest that man usurp the throne rightly belonging to his son. Teseo’s sword brings about the recognition between pater and son; thwarted Medea pronounces her wrath on all and makes her escape. Minerva’s priest arrives to protect the Athenians and conclude this opera, so that Arcane and Clizia, Teseo and Agilea, may proceed to unite. The singers were exceptional and cast to perfection. 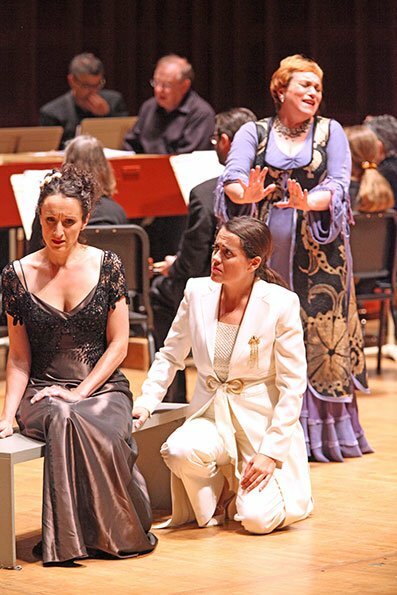 Soprano Céline Ricci’s dark, powerful voice brought depth to the role of Clizia, and served as a foil to Amy Freston’s Agilea. Freston is a virtuosic soprano with a supple voice and a broad palette. Countertenor Robin Blaze sang Arcane and his bright, ebullient voice shone forth throughout, a treat to hear. Drew Minter (countertenor) here sang the role of Egeo; his versatile voice is bright and dark by measure and he adapted as the occasion demanded. Endowed with charisma, he took the stage with the regal presence of a king to the manner born. Soprano Dominique Labelle excelled as Medea, with her rich, deep, powerful yet never heavy voice. A foil to Minter, matching his charisma and presence, she more than held her own during their duets. Their “fake breakup” aria “Sì ti lascio / Sì ti sprezzo” was a model of banter, hidden anger and seeming insouciance: a treat to witness. Labelle came into her own with the singing of anger and wrath in Act III and after, harnessing her vocal power to deliriously ecstatic effect; “Morirò, mà vendicata” (Act V) was spine-chilling. Amanda Forsythe (soprano) sang the title role of Teseo (perhaps the only guileless character in this opera), a role which becomes more present and substantial as the evening progresses. Forsythe’s pellucid voice admirably rose to the challenges of this role —the virtuosic runs and arpeggios, the pathos, the grandeur replete with humanity. Jeffrey Fields (baritone; priest of Minerva) and Jonathan Smucker (tenor; chorus) rounded out a stellar cast, and these two brought the only lower registers heard anywhere in this opera, and once in the middle and then in the finale. Nicholas McGegan and Philharmonia Baroque Orchestra delivered thrills with joie de vivre. This was not historically inflected performance which was in any way reduced or stripped; rather it was playing of precision and excitement which accomplished the difficult feat of transporting us back into the time when this music was new, fresh and alive. A fabulous performance; I would happily see it again and again and again. Philharmonia Baroque Productions has just released a CD of highlights featuring this cast.